Although by the late 1920s Fifth Avenue below Central Park was nearly completely commercial, East 57th Street, stretching eastward, still clung on as a respected residential neighborhood. At the northeast corner of Madison Avenue and 57th Street stood the 1870 Central Presbyterian Church (originally built as the Madison Avenue Dutch Reformed Church). 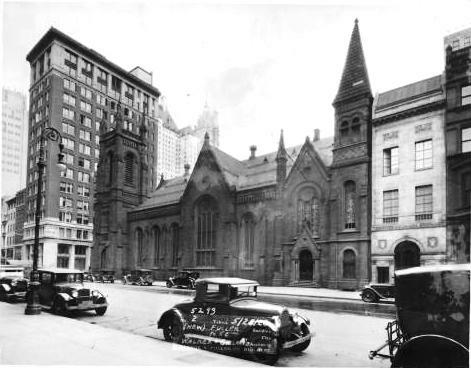 The 60-year old church was about to come down and in its place would be an Art Deco tour de force and the beginning of the end for residential 57th Street. At the turn of the century, the Fuller Construction Company, under the direction of Harry S. Black, was a pioneering force in the erection of skyscrapers. The energetic Black diversified his deceased father-in-law’s contracting firm, the George A. Fuller Company, to include the construction branch and a real estate company, the United States Realty and Improvement Company. 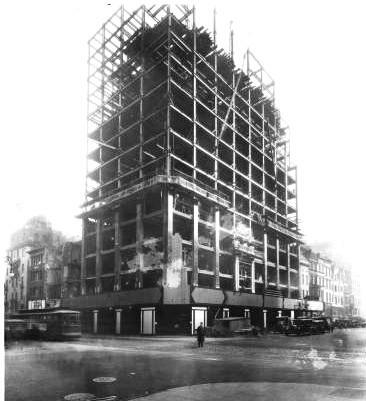 The Fuller Company would go on to construct monumental and important structures – old Pennsylvania Station, the main Post Office on 8th Avenue, the Plaza Hotel, the Lincoln Memorial and the U.S. Supreme Court Building in Washington D.C. among them – but perhaps its most ground-breaking structure was its own 1902 headquarters building. Only 26 years later, the Fuller Company decided to leave its headquarters to move uptown to a larger building. One factor in the decision was simply that the 23rd Street location was no longer the center of the business area. In 1928 the Fuller Company purchased for $3 million the Central Presbyterian Church which The Times called “one of the landmarks of that area,” and commissioned Walker & Gillette to design their soaring new headquarters. The architects designed the “salon shop spaces” on street level as vertical shops—the high-class stores could rise several levels rather than spreading horizontally. The lower floors were clad in polished black Swedish granite. Above, Rockwood limestone was ornamented with crisp black slate geometric Art Deco shapes. The "salon spaces," seen from the Madison Avenue side, offered enormous expanses of glass. Architect A. Stewart Walker, who was already on friendly terms with the esteemed artist Elie Nadelman, offered him the commission to do a large bas-relief sculpture over the 57th Street entrance. Although Nadelman, who had influenced artists like Pablo Picasso, had never done architectural sculpture, he accepted. His completed sculpture, which doubles as the background for a clock, features two muscular workmen dressed in Roman attire and leaning on their hammers against a frieze of stylized skyscrapers. The Fuller Company had learned its lesson with the Flatiron Building. 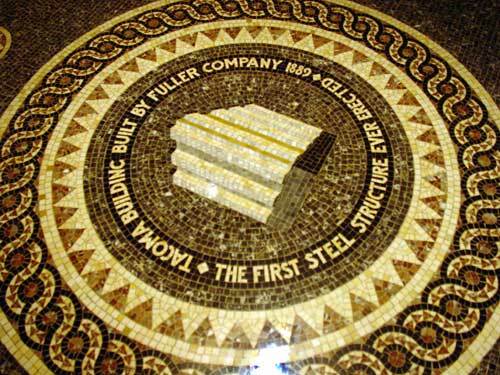 Below the massive sculpture in huge lettering the name FULLER BUILDING was prominently announced. Beneath Nadelmen's story-high sculpture the building's name is prominently displayed. Walker & Gillette managed to hint at traditional architecture with Art Deco ornamentation. The three-story tall entrance is supported by great pilasters instead of columns. Fluting is suggested by stripes and capitals are replaced by triangular, two-dimensional decorations. The 57th Street entrance rises three stories to the sculpture and clock. Above it all, the Aztec-inspired crown could be seen for blocks. Sunburst patterns exploded from the story-high round windows under a ziggurat laden with black-and-white geometric designs. Indeed, within two months and despite the onset of the Great Depression, all space between the 7th through the 20th floors was leased. The art gallery spaces—the 6th through 15th floors—became the major high-end gallery location for decades. Throughout the years famed galleries such as the Pierre Matisse Gallery, the Andrew Crispo Gallery, the Zabriskie, David Findlay Jr., David McKee and Robert Miller galleries would be here. Andre Emmerich’s gallery would highlight works by David Hockney and Al Held along with pre-Columbian art. In the Charles Egan Gallery, whose walls were painted by Wiillem de Kooning and Franz Kline, works by Joseph Stella, Mark Rothko, Paul Klee and Georges Braque were exhibited. A disciplined riot of setbacks serve as the base for the soaring central shaft. The competing 2002 Four Seasons Hotel is behind (to the right). 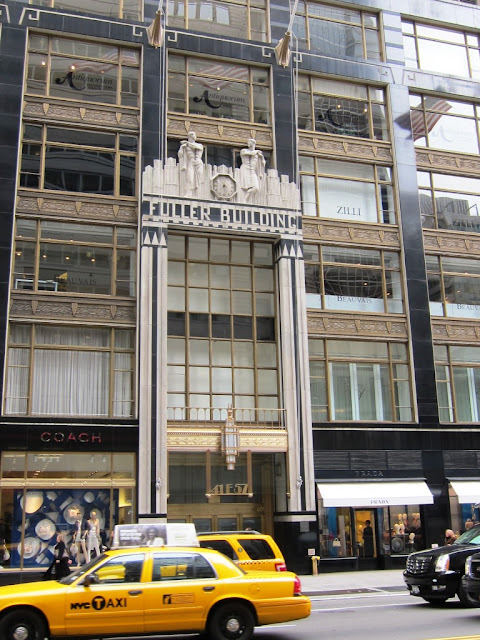 Owners of the Fuller Building, which the Landmarks Preservation Commission calls “and outstanding example of…Art Deco skyscrapers” and others call a “masterpiece,” announced plans in 2005 to convert the upper floors to luxury residential condominiums. I gave to disagree with Carter Horsley. The Four Seasons imo is a very nice piece of contextual architecture which echos both the Fuller Building and the Ritz Tower at 57th and Park. If you can find the right spot on the north side of a high floor of one of the buildings south of these 3, you will see how nicely they echo each other. What a shame that the architect of the hideous black box building on the southwest corner of Park and 57th did not attempt to do what I M Pei did with the Four Seasons.